West Valley, Arizona – For help understanding new tax laws and how you can benefit while still supporting your favorite nonprofits, join us at Benevilla’s next Education Event Series workshop, “Smarter Ways to Give.” Presenter Gary Frisch, CPA with the Monheit Frisch Group, will deliver an interactive workshop on gift strategies and tax planning Tuesday, October 2nd at 9:30AM at the Benevilla main campus in Surprise. Attendees will benefit from expert insights into how savvy taxpayers can charitably donate and lower your taxes even with the recent tax law changes. Whether you typically itemize or take the standard deduction there are some strategies you can use to receive new tax savings as well as other non-tax benefits. Charitable IRA rollovers, gifts of appreciated assets and the Arizona Tax Credit program are among the topics to be covered at this tax planning workshop. This FREE presentation is part of Benevilla’s popular community “Education Event Series,” which offers helpful resources and real-world solutions for older adults. Each workshop features area professionals and subject-matter experts who can offer guidance and answer your questions. The Benevilla main campus is located in Surprise, just south of Bell Road and Sun City West in the Hellen and John M. Jacobs Independence Plaza at 16752 N. Greasewood Street, Surprise, Arizona, 85378. Reservations are required. Please call Benevilla at 623-584-4999 to reserve your spot. Light refreshments will be provided. Started by the community and for the community in 1981, Benevilla is a not-for-profit human services agency dedicated to enriching the lives of West Valley residents by providing care services for older adults, adults with cognitive disabilities, children, and families. Services are provided through a dedicated group of staff and volunteers. For more information on services, volunteer opportunities, to donate to Benevilla or to schedule a tour call 623-584-4999 or visit www.benevilla.org. 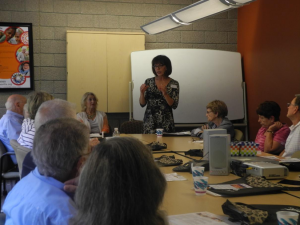 Expert speaker presents important information to attendees at a previous Benevilla Educational Event workshop.